“I’m not going to say just what and when, but I will confirm that both the White Council and Dol Guldur will feature in the movies. And not just in one scene either. Just how to visualise it has been a challenge, but fortunately Alan Lee and John Howe went crazy with ideas, and it should look pretty cool. 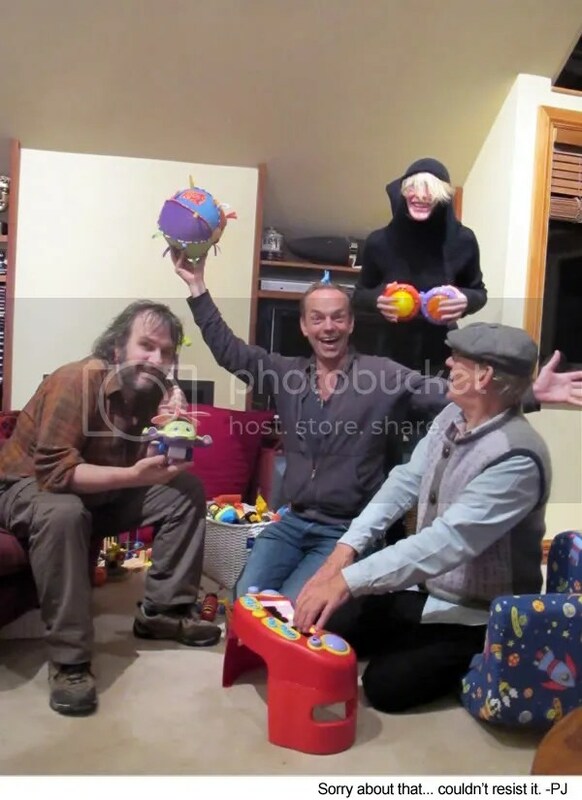 Since an earlier glimpse of the actors playing the Dwarves (filmed to raise money for a New Zealand earthquake telethon) was in a similar spirit, I’ll add that below. There’s also a charming interview/set-up with Ian McKellen, who lets slip a few hints about Hugo (and especially Cate) on set. There’s also a new press release from the production confirming the two films’ official titles (The Hobbit: An Unexpected Journey and The Hobbit: There and Back Again) and the recent bunch of cast additions, including Hugo… most of this will be old news to anyone keeping tabs on the films ;), but for those comforted by the most bureaucratic sorts of confirmation, Cinema Blend reprints the whole thing. The two films will be released in December of 2012 and 2013… meaning 2012 will be another major year for Hugo if Cloud Atlas is released on schedule. A lot of movie blogs have glommed onto the two sentences in his recent Herald Sun interview about playing six characters in Cloud Atlas. (I suspect all of the six major cast members will do the same thing, though everyone here will agree that Hugo has the greatest scene-stealing potential under the circumstances). 😉 While it’s natural to be curious about such an ambitious project, it’d be nice if all those movie blogs would at least mention the film Hugo gave the interview to promote– Oranges and Sunshine– rather than just try to scoop/speculate about a movie that doesn’t even start filming until the fall. Since the print version of the article includes a new pic of Hugo and both of the online pieces, I’ll embed that below. For a larger-size version of the article, go here. Hugo was also interviewed by FilmInk and Inside Film while promoting Oranges and Sunshine; I’m working on getting copies of those articles as well. Looks like it’s going to be a very busy year for him, with something for everyone. 😉 So there will definitely be more to come. Those waiting for the stateside version of Uncle Vanya will be pleased to learned that the Sydney original reaped record profit for the STC. You can read more about that in the Sydney Morning Herald, The Australian and Broadway World. You can watch the trailer (or watch it again, heh heh) here. Tickets for the Kennedy Center engagement go on sale to the general public on June 10. 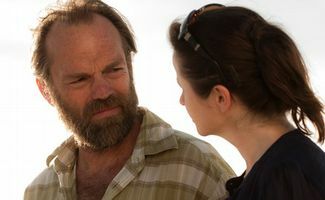 Hugo Weaving’s latest film Oranges and Sunshine was featured in an opening-night gala at the Dungog Film Festival last night (May 26), paired with the Oscar-winning short film “The Lost Thing”. Hugo was unable to attend, as he’s returned to New Zealand to resume work on The Hobbit. 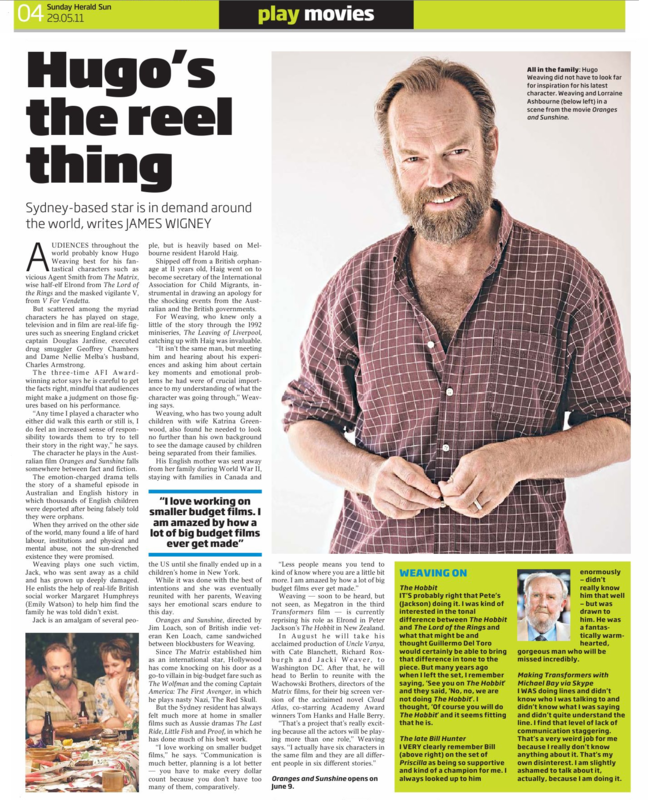 So far the only press story I’ve found on the Dungog screening (other than promotion) was in The Newcastle Herald. Hugo was one of five Australian actors who had streets in Dungog temporarily renamed after them for the festival (the others were Geoffrey Rush, Cate Blanchett, Hugh Jackman and the late Heath Ledger.) You can read about that (and view Dungog street maps) in The Newcastle Herald and The Courier Mail. HOW HAS A TRUE STORY ABOUT A GROSS INJUSTICE LIKE ORANGES AND SUNSHINE AFFECTED YOU ON A PERSONAL LEVEL? It didn’t happen to me, so in a way it’s not personal. However, I do try to understand what it’s like to be in someone else’s shoes — I try to illuminate the character to make it come alive. But then again, as an actor I’m affected by almost everything, as we’re constantly learning. IS IT MORE DIFFICULT TO PORTRAY A REAL-LIFE CHARACTER? The challenge lies in the psychological investigative work. I have to almost mimic the character and explore why they’re like that. However, in the end it’s the same process, whether it’s a real-life character or not. HOW DID YOU ENJOY WORKING WITH EMILY WATSON? It was absolutely delightful. I love her work — Breaking the Waves was the first film I’d seen from her many years ago. She’s warm, smiley and sensitive, with an easy strength about her — and she’s a brilliant actress. I only have one small scene with David, unfortunately. However, we did have a couple of nights out on the town! I’m also an admirer of his work. Jim Loach is a calm, sensitive and intelligent man to work with. The material was raw and very emotional, but it was easy to accomplish. I spent one day in Nottingham, and five in Adelaide, but the actual work on set was just very easy. It’s just a joy and privilege to work with Emily and Jim. OUTSIDE OF ACTING, WHAT RELAXES YOU? I like to read a lot, but really, my primary focus is my family. I also love travelling. WHAT MADE YOU DECIDE TO TAKE ON THE ROLE OF JACK, ONE OF THE NOW GROWN-UP CHILDREN? The script arrived, and I took notice when I knew that Jim Loach was directing, as I’ve been a huge fan of his father’s films. It was a combination of the right script, director and an incredibly moving story. HOW DID YOU RELATE TO JACK? Well, it’d be quite hard not to relate to the story. You’d have to be inhuman. It’s an incredibly sad story, about someone whose life was almost destroyed. WHAT DID YOU USE TO FLESH OUT AND INFORM YOUR PERFORMANCE? I met the man on whom the character of Jack was based, who’d been sent out as a child from England at the age of 10. It was very easy to understand his pain. My own mother was taken away from her family during the war, when she was only four. If you’re a child who is taken away, you miss the love and nurturing that you should be getting. Oranges and Sunshine is in theatres from 9 June. And here’s a different clip, which thankfully was public-posted on YouTube so anyone can watch it. 😉 It, too, is low-res, but that’s because it appears to have been shot on a cellphone camera. But there’s a little segment with Hugo (this interviewer seems more a David Wenham fan) as well as Margaret Humphreys and one of the child migrants who inspired the film. Unfortunately, that seems to be it as far as media coverage is concerned. None of the major online Aussie papers have posted anything about the premiere. But I do know at least two of the monthly movie magazines in Australia will include coverage of the film in their June issues, and I’m working on getting copies. It’s also possible the other media outlets will post more when the film opens wide in Australia, on June 9. Video Ezy has posted their coverage of the Oranges and Sunshine premiere to YouTube. 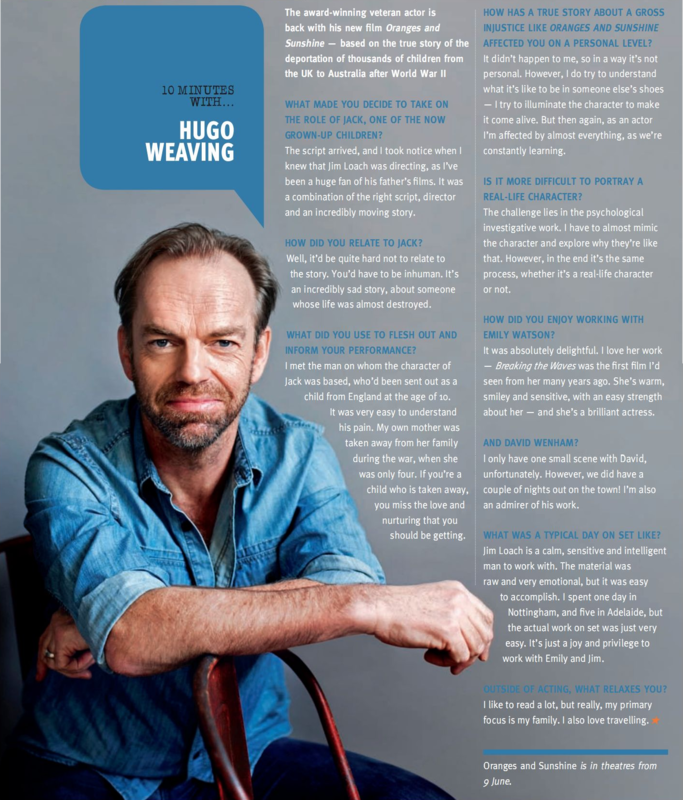 Included are not only interview with the cast and crew of the film (including Hugo Weaving, David Wenham, and Jim Loach) but with the real-life inspirations for the characters in the film (Desmond McDaid was the winningly irascible inspiration for Wenham’s character, and makes a huge impression in Empty Cradles).